Jobu Design "Jobu Jr. 3 Deluxe Kit"
If using a large Canon or Nikon lens, we HIGHLY RECOMMEND using a Jobu Design replacement foot, like the LF-C604 or LF-N604. A replacement foot will lower the centre of gravity of your lens and make it lighter. In most cases, large lenses with tall lens-collar feet CANNOT balance on a Jr.3 without a LENS FOOT. We recommend replacement feet for the Nikon 300F2.8, 200-400, 500F4 and 600 F4, and the Canon 500F4 (IS 1 and 2) and 600F4 (IS1 and 2) and 400 F2.8 IS. The Jr.3 Deluxe kit weighs in at 1.5 lbs, 680grams. This is the lightest, best functioning gimbal head on the market, capable of supporting and balancing a 500F4 and Pro body comfortably. Yes, we still recommend a bigger HD3 or Pro2 gimbal for daily use, but if weight is your primary concern and you are travelling by air extensively, then lighten your load: Get a Jr.3 Deluxe, your back will thank you. 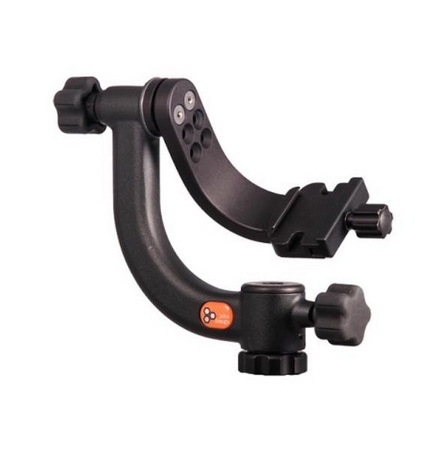 The Jr.3 Deluxe, and our other gimbals fit any tripod with a standard 3/8"-16 threaded top. We DO NOT RECOMMEND tripods with a 1/4"-20 thread under any circumstances. Using a 1/4"-20 threaded tripod with a reducer bushing will VOID your warranty. You still need to buy 1 lens plate or replacement foot for each lens you are going to mount in your gimbal.